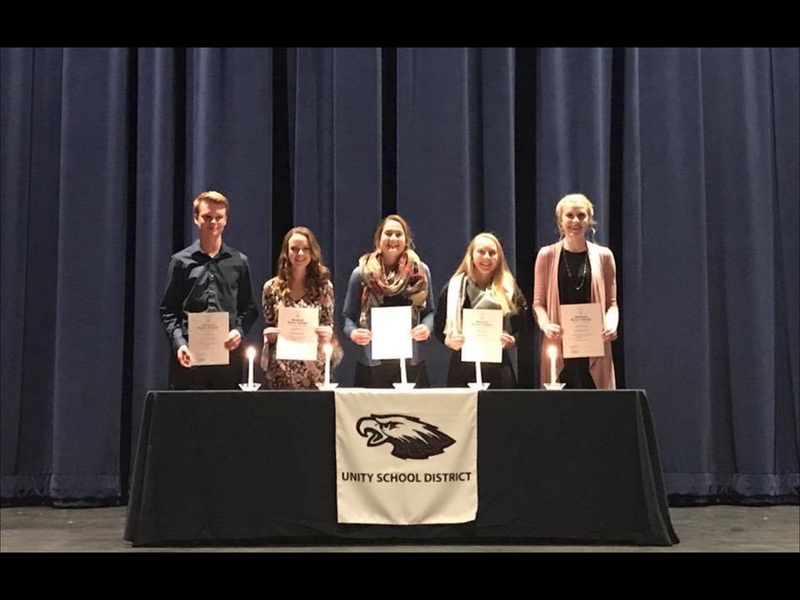 On Monday, November 13th, Unity High School inducted five new members in to its chapter of the National Honor Society (NHS). Natalie Albrecht, Michaela Hol, Hunter Robinson, Hallie Allen, and Madelyn Kemis were inducted at the ceremony in the Performing Arts Center after a dinner with their families and current members. In order to be inducted into the NHS, a student must meet standards of scholarship, leadership, character and service. Students eligible for selection (based on scholarship and having a GPA of 3.5 of above) must indicate submit materials demonstrating their accomplishments in the three areas of character, leadership, and service. Current Unity NHS members include; Allison Colbert, Ciara DeLozier, Lauren Frokjer, Zenia Moore, Gavin Olson, Asher Cress, Daniel Ebensperger, Cody Ince, and Stella Nelson.